Every child deserves the possibility of a quality music education. Without exception. 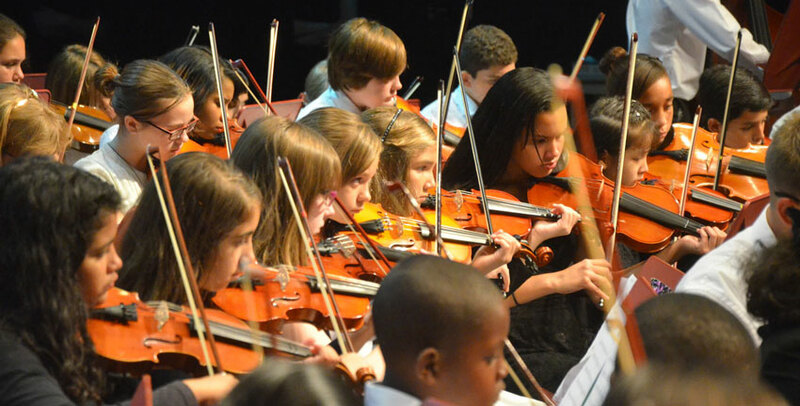 The Flagler Youth Orchestra strings program is that unique opportunity. Serving nearly 400 students ranging in age from eight years old to 19, the membership of the FYO is as diverse as they come, and through music we celebrate this diversity. Here in Flagler County, we’ve taken what has been perceived as an opportunity only for the privileged and made it accessible to all the children of Flagler, regardless of their race, social or economic circumstances. Think back to your own youth: was music a key part of that experience? It may have been a particularly formative and memorable part of your life. If you didn’t have music education in your childhood, you may now realize as an adult what you missed out on. We believe no child who wishes to play and learn more about orchestral string instruments and music should go without. Fund three of our teachers. Spend two days in Flagler public schools recruiting new students each year. Buy new instruments for students who apply for scholarships. Repair and maintain orchestra-owned instruments. Provide playing accessories to students in need, like shoulder rests, strings and method books. Buy music for our library, and the rights to play that music. Fund chamber coaches for our yearly chamber music camp. Our future goals also include improving the quality of our scholarship instruments, adding additional teaching staff, and preparing for potential funding shortfalls. Any amount helps. Together, with a little help from many, we can continue to build this unique program while sending a clear message to the children of Flagler County that everyone deserves opportunity. They, too, can dream big. We’re dreaming big for them, but we need your help. Help us continue to make this program a jewel of Flagler County. Cheryl Tristam and FYO’s family and friends.